Well, it’s bitter cold here today, my fingers were numb walking Lola. Ugh. I had some leftover turkey chili for lunch, with a nice dollop of lowfat sour cream to warm up my belly. Last week I made this delicious tuna salad. Tuna, is a great addition to a diet, a couple times a week, to add some low fat protein. I always try to add vegetables or fruit with my tuna. I also try to make my own salad dressing instead of using mayo. 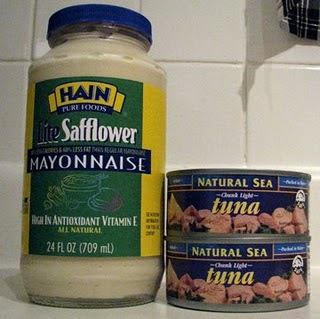 But, when I go use mayo I use Hain’s Lite Safflower mayo. It’s delicious, and only 45 calories, with no saturated fat, and high in vitamin E.
Whisk together the mustard and sweetner(honey or agave nectar). Then, add a shake of salt and the vinegar. Whisk together. Add oil. Whisk and add the pepper. You might need to play with the oil and vinegar amounts with how thick or thin you like your dressing. To really bring down the fat content, add only one teaspoon of oil, and one to two teaspoons of water.